Atrophy is a wasting or decrease in size of a bodily organ, tissue, or part owing to disease, injury, or lack of use. You may have heard this term used in reference to accident or paralysis victims: "his muscles atrophied because of non-use". Don't let your safety training atrophy. 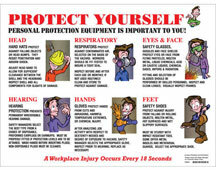 Get signs, safety posters and more at Safety Emporium. Exposure to certain chemicals can cause internal organs to degrade, weaken and decrease in size, particularly with chronic (long-term) exposure. While muscles can be rehabilitated through exercise, it is fairly tough to give your kidneys or liver a strength-building workout! Muscle Atrophy, an article in the MedLinePlus Encylcopedia at the National Institutes of Health. Muscle Atrophy, at the U of Maryland Medical Center. Cerebral (Brain) Atrophy at WrongDiagnosis.com.